The conventional wisdom is that the North Hall is probably the oldest and one of the least changed of the State Rooms in Stowe House. It is described as now being essentially as rebuilt in the early 1730s with some rearrangements made in the late eighteenth and early nineteenth centuries. Its installation was necessitated by the building of John Vanbrugh’s North Front. According to George Vertue the painted ceiling is the work of William Kent, in 1734. It consists of grisailles set against a gold mosaic background. Around the coving are roundels depicting classical deities, each representing a day of the week: Mercury (Wednesday), Jupiter (Thursday), Venus (Friday), Saturn (Saturday), Apollo (Sunday) and Diana (Monday). 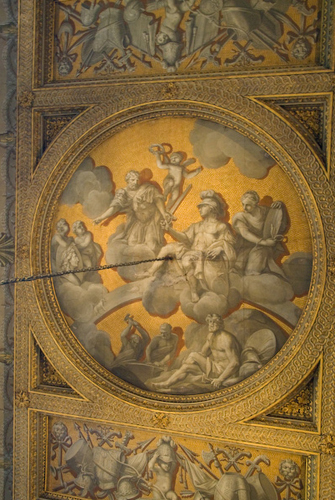 The central ceiling painting depicts Mars, the god of war and deity associated with Tuesday, handing a sword to Lord Cobham – commemorating the day that Cobham received his own Regiment of Foot (Tuesday, 12 February 1702) from King William III. 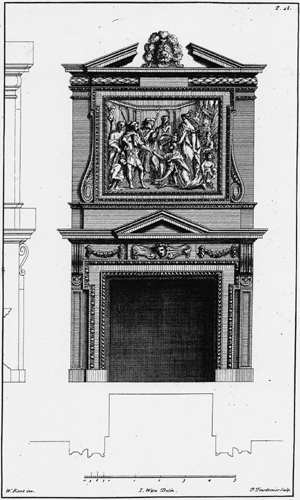 Kent also designed an elaborate fireplace and overmantel for the west wall of the room, incorporating The Family of Darius relief by Christophe Veyrier.2 The idea was that visitors entering through the North Hall would warm themselves by the fire, looking up at their great host. The overmantel had been removed by 1788, and the fireplace had gone by 1832 and replaced with a recessed arch.3 The flue remained to draw the smoke from the concealed sarcophagus stove in the Egyptian Hall below. The staircase leading down to the Egyptian Hall was added when the new winter entrance was installed by the Marquess of Buckingham in 1803. In the mid-eighteenth century the walls in the North Hall were painted with “Ornaments of Festoons, &c.” – presumed to have been painted by Kent and removed by 1788 when the number of antique marble busts was reduced from eleven to eight. 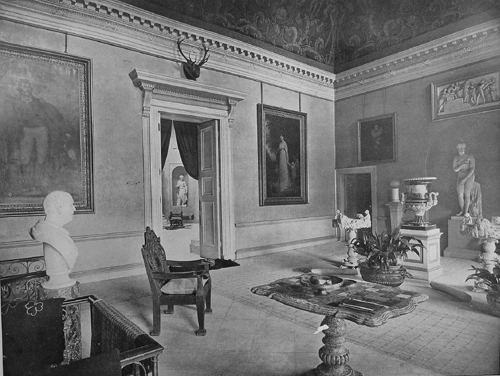 The walls were originally hung with paintings and the room itself was filled with various antiquities and furniture. suggesting that such a feature was unusual. The current floor is not the original and it has been assumed that originally flooring of the same style as can still be found in the adjoining east and west corridors was employed. 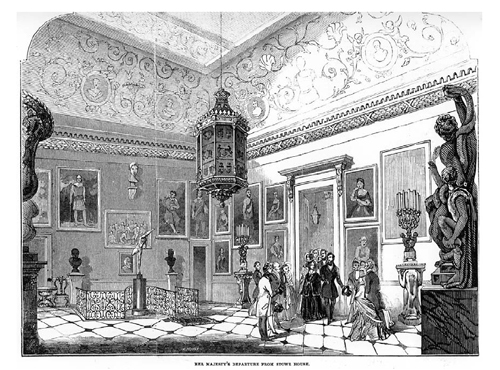 This black and off-white floor can be seen in the image from The Illustrated London News, reporting on the Queen’s departure from Stowe in 1845 (above). The wrought-iron balustrade around the staircase of 1803 is similar, but inverted, to Jean Montigny’s work in the Admiralty, Whitehall. Montigny made the gates for Wotton, paid for by Sir Richard Temple of Stowe in 1711. 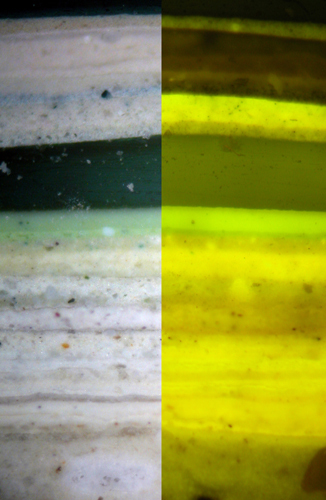 The analysis of the paint has managed to identify a further major change that took place in the room as well as providing dates to a number of the decorative schemes. 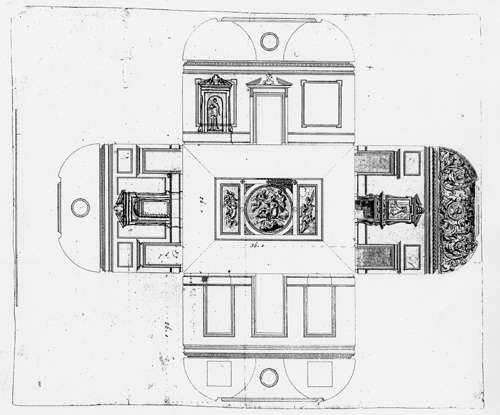 William Kent’s laid-flat plan of the 1740s shows an aedicule/niche in the centre of the east wall; a chimneypiece with overmantel on the west wall and what appears to be the option of either an aedicule/niche or of a simple panel in the centre of each half of the south wall. 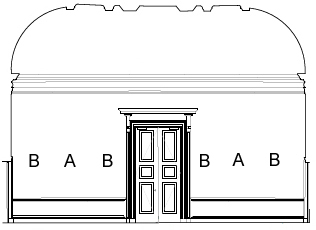 Cross sections of the paint from the centre of both halves of the south walls (marked A) display fewer schemes than to the right or left (marked B). 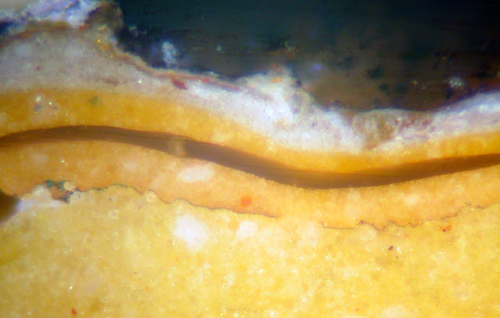 Samples from the centre of the walls start with the sixth (terracotta) scheme that was found on the other walls in the room. 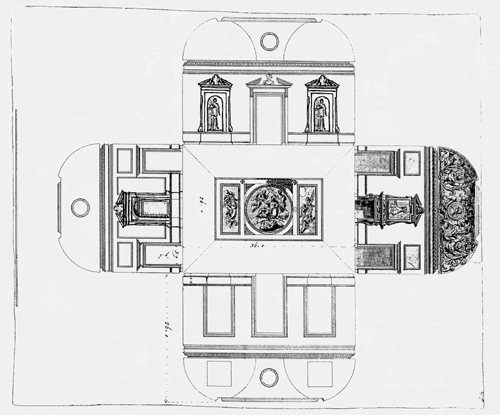 It is thought that there may have been niches that were removed at some stage before Queen Victoria’s visit of 1845. An initial exploration has revealed what may be a niche that was covered over. The discovery of this has only been possible through the making of cross sections, as have been the clues to the dating of the various schemes. 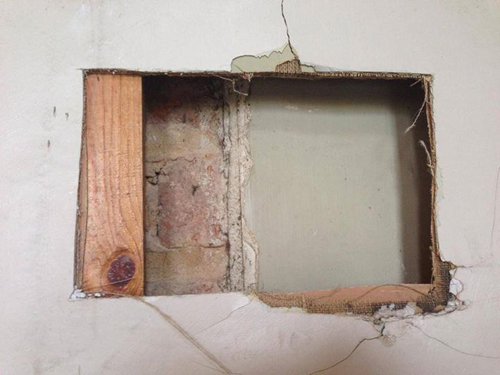 Just imagine what a practitioner of the ‘Paint Scrape’ would have made of this…. 1 Much of this has been taken from Michael Bevington’s excellent history – Stowe House. Paul Holberton Publishing. 2002. 2 The relief on the east wall is of Caractacus before the Emperor Claudius by Thomas Banks. 3 It is possible that the fireplace was moved to the Servants’ Hall.